Reverend Percy finally convinced the Church of England to relocate the Mission to the Solomons, ostensibly to be closer to the population of focus. “Leaving our company now, Reverend?” A familiar voice chuckled from the darkness. 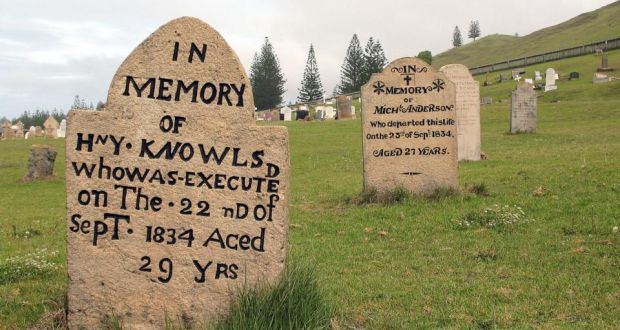 In 1920 the Melanesian Mission abandoned the former penal colony to the blacked souls of all the prisoners who lived and died there, and yet live on. I composed this wee tale for the What Pegman Saw flash fiction writing challenge. The idea is to take a Google maps street image and location and use them as the inspiration in crafting a story no more than 150 words long. My word count (after a lot of editing as the original was over 100 words longer) is exactly 150. Today, the Pegman takes us to Norfolk Island. I did a bit of Wikipedia research and discovered that it was yet another penal colony back in the day. What made it unique is that prisoners who had been sent to the Australian penal colony and who continued to commit crimes that should have earned them the gallows were then sent to Norfolk, a place of unspeakable brutality and sin according to this report. I also learned that the island had been the headquarters of the Church of England’s Melanesian Mission between 1867 and 1920. In 1920, the mission was moved from Norfolk to the Solomon islands to be closer to their “population of focus,” but in my story, I suggest that it really moved because the hordes of blackened souls of all the damned prisoners of the colony horribly haunted and tortured the good Reverend in charge. The mission finally abandoned the island of Norfolk, which had become a Hell on Earth. Being so close to Halloween, I thought I should turn the prompt into a ghost story. Of course, all this is fiction as are the names of the two people in my tiny saga. Woah, you really brought this to life! Excellent Halloween take on the prompt, James. Stunning photo, too. Thanks. When I clicked on the Google maps image, all I got was a black screen. I wanted some authentic sounding character names so I Googled “meanest prisoner at Norfolk Island and that site came up. Imaged seemed appropriate. Fun that we both picked the same photo for our Pegman picture! We did? I’ll have to look at your story. Been busy with yard work, both at home and at my son’s house. You’ve written a fluent, powerful story, James. I like the voice you found for the Reverend Percy; it felt authentic. Both of their voices seemed to come out of any number of historical movies with a religious/supernatural base. Being a fellow of my age means you’ve got a lot of useless trivia running around in your head. Thanks, Penny. You used excellent dialogue to convey your story. It is better that they spend the money on the living than the dead. Especially if the dead are out to get you. Thanks. A story rife with desperation, and resignation, which hints at the horrors experienced. A competently written story, James. Thanks, Kelvin. Glad you liked it. Creepy stuff. I liked the Reverend and his dialogue with the blackened soul. chilling and also thought provoking…. I’m sure they are thoughts the good Reverend Percy would rather not have to contemplate again, though no doubt they will haunt his dreams for the rest of his life.